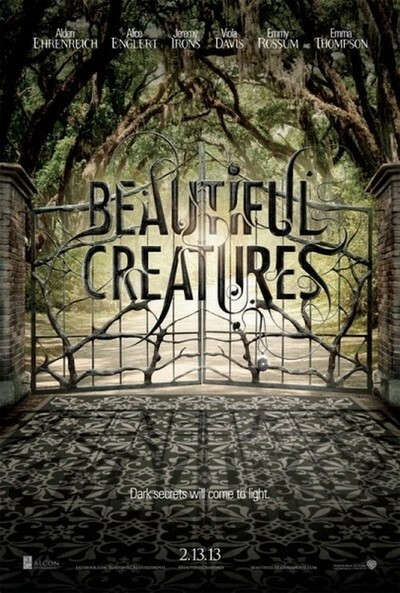 With "Beautiful Creatures," we continue the seemingly inevitable march toward a cinematic America with a population 50 percent human, 50 percent "other," including but not limited to superheroes, mutants, vampires, zombies, werewolves, mummies, fairies, angels, witches, ghosts, demons and the undefined undead. One big difference: This time around it's the boy who's the human, and the girl who has the ability to make magic, both wondrous and dark. Also, "Beautiful Creatures" has a much better sense of humor about itself than the "Twilight" movies, with most of the grown-up actors delivering performances leaning more toward the devilishly campy than the straightforward and dramatic. Oscar winners Jeremy Irons and Emma Thompson, Oscar nominee Viola Davis and the wickedly lovely Emmy Rossum are all having great fun in this movie. If only that approach extended to the two young leads, who spend so much time brooding and lamenting and trying to figure out the rules of the supernatural game they don't seem to be enjoying themselves at all. Based on the first of the four "Caster Chronicles" young adult novels by Kami Garcia and Margaret Stohl, and directed with considerable style by Richard LaGravenese, "Beautiful Creatures" is told mostly from the POV of teenager Ethan Wate (Alden Ehrenreich), who can't wait to escape a town so backward you'd think they'd never seen "Footloose." Immersing himself in seminal 20th century literature by the likes of Vonnegut and Salinger, eager to shed the prayer-happy ex-girlfriend who refuses to believe they're really over, Ethan is plagued and intrigued by a recurring dream on a Civil War battlefield not far from his home. When Lena Duchannes (Alice Englert) arrives at school on the wings of a hundred rumors about her family and their devil-worshipping ways, Ethan is convinced he's met the girl of his dreams. THE dream. The Bible-thumping townsfolk — and they come THIS CLOSE to actually thumping their Bibles — believe Lena and her clan are the spawn of Satan or at the very least witches, and you know what? They're not far off. Well. Suffice to say there are many stipulations and potentially tragic land mines ahead, and "Beautiful Creatures" stops in its tracks from time to time so Lena or one of her relatives can outline the rules, as if we're all attending an elaborately costumed theme dinner party populated by actors who refuse to break character as they mill about, spinning their tale. All Casters are either Dark or Light (think "Oz" and good witch/bad witch), and Macon is a Dark Caster, but he tries to keep those impulses in check as he carefully watches over Lena, who will learn her true nature on her 16th birthday. There's no such impulse control when it comes to the evil Sarafine (Emma Thompson) and the salacious Ridley (Emmy Rossum). They are Dark Casters through and through, and they're rolling in it. Sarafine can assume the identity of humans and cause all kinds of trouble from within, while Ridley is like a temptress in a Super Bowl commercial, roaring into town in a red BMW convertible and having her way with the boys. "Beautiful Creatures" springs to life whenever Irons, Thompson or Rossum is centerstage. (We also see fine work from Viola Davis, though she's stuck with a cliched role as a perpetually concerned mother figure who knows a lot more about the town's cursed history than anyone.) The grown-ups get to wear all the coolest costumes and spout all the juiciest lines. Problem is, this isn't their story. It's first and foremost a semi-plodding teen romance with supernatural overtones. Ehrenreich is saddled with a character whose primary strength is his irritating persistence. As was the case with Bella and her lip-biting, shoe-staring ways, we wonder why anyone in the supernatural community would be so smitten. Alice Englert (daughter of director Jane Campion) is a promising talent, but there's not a ton of depth to Lena, either. Maybe that's because she's 15, and even when you're a Caster, at 15 your most interesting days are still in front of you.